Joshua House Ministries is located on Millsboro Highway in Gumboro, DE approximately 1 mile from the Gumboro Firehouse on the right....look for the Joshua House Ministry enclosed trailer. 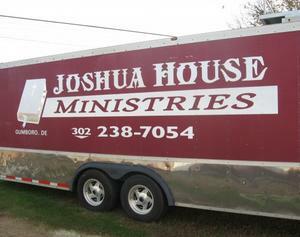 oshua House Ministries is located on Millsboro Highway in Gumboro, DE approximately 1 mile from the Gumboro Firehouse on the right....look for the Joshua House Ministry enclosed trailer. If you extend your soul to the hungry and satisfy the afflicted soul, then your light shall dawn in the darkness, and your darkness shall be as the noonday. The Lord will guide you continually, and satisfy your soul in drought, and strengthen your bones;you shall be like a watered garden, and like a spring of water, whose waters do not fail.